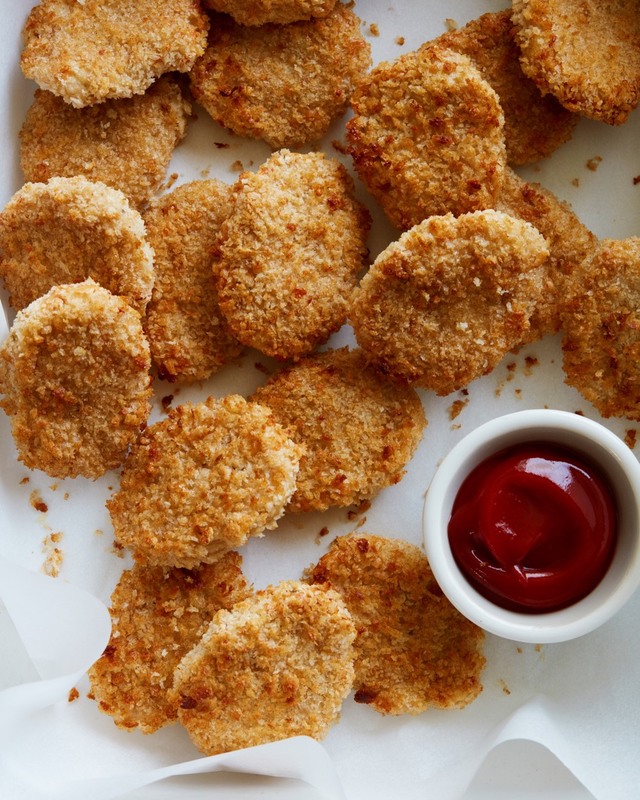 How often do you pull a box of frozen chicken nuggets from the freezer for lunch or dinner? Once a week? Twice? If your kid really loves them, I'd wager it might be even more than that. I get it. 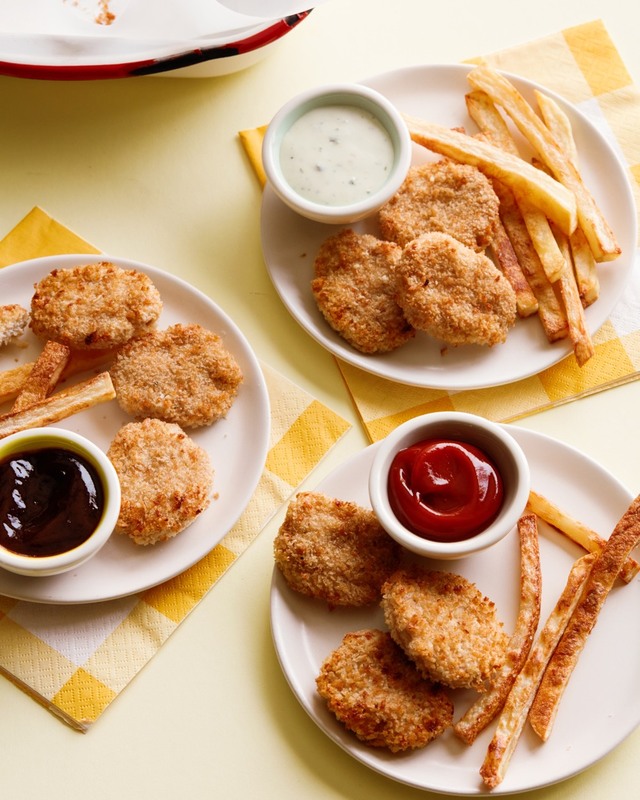 Chicken nuggets and French fries are convenient and kids will eat them. But what ingredients make up your favorite brand? Are they made from things you want your little ones eating? These are unbelievably easy chicken nuggets are to make, absolutely delicious and made from ingredients you can pronounce. The best part is that you can make a huge batch and keep them in the freezer for future meals, so not only do they save on the expense of boxed nuggets but also the time it takes to go to the grocery to buy them. Recently I made these on Facebook Live, how to freeze them on sheet pans and then pop them in zipper bags (before baking). All you need to do is follow the baking directions below so that you can bake off the amount you need instead of the entire recipe. 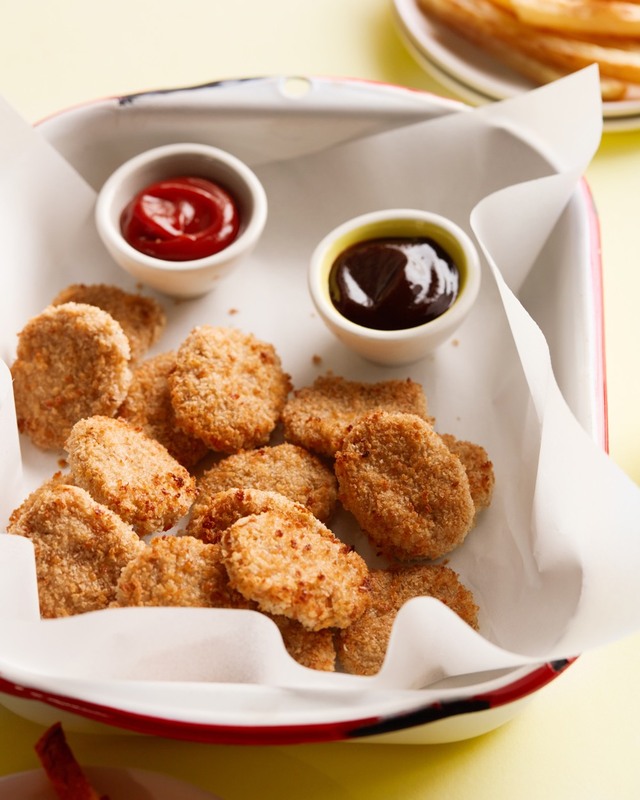 Crispy on the outside, tender inside, freshly made easy chicken nuggets your kids will beg for everyday. What could be more simple, economical, nutritious and yummy than that? 2. Place the first 6 ingredients in a food processor until chicken is finely chopped and ingredients are combined. 3. Place the bread crumbs and parmesan cheese in a shallow bowl or on a plate and stir to combine. 4. With moistened hands, roll 1 tablespoon of chicken mixture between your palms and flatten it into a “nugget” shape. 6. Place nuggets on a cooling rack. Place cooling rack over a foil-lined baking sheet. 7. Lightly spray nuggets with cooking spray. * To freeze, place nuggets on a sheet tray after this step and freeze for one hour. Place nuggets in labeled freezer bags for up to 3 months. When ready to cook, follow the directions starting with step #6. ** If you want your nuggets to be golden brown, place under the broiler for 2 minutes after cooking. Might be a stupid question but should the chicken Breast be cooked prior to puttIng in the food processor? Good recipe! I love making homemade chicken nuggets and strips and freezing them for quick dinners or lunches! (I love any recipe that I can make double and freeze to have a quick, healthy meal on another day!) I have a similar recipe that I use and love but it doesn't have oatmeal so I will have to give this one a try! Thanks for sharing!! I know you mentioned the chicken should be raw and not to cook prior to putting in the processor, but would it make a difference if you did cook chicken first? If you cook the chicken first it won't hold together with all the other ingredients, and when you go to bake it the chicken will become overcooked and very rubbery. We're a veggie family so if I wanted to make tofu (or seitan) nuggets, would I simply substitue out the protein or would I need egg to hold it together? any way to make these if you don't have a food processor? If you don't want to process the chicken, mix the spices in with the crumb and follow the same steps. My three don't like the texture of the chicken once it's been processed and it removes a step and clean up for me. I love the spice mix, thanks for a new flavor. Cheers. You can buy ground chicken, or ask at the butcher counter of your local grocery to grind it for you! Does anyone have a recommendation for a food processor? I think it's time to buy one! I have a Hamilton Beach 70670. It's a pretty basic, middle-of-the-road one (about $45 on Amazon), but it's been great. Does everything I need, and I make a TON of weelicious recipes! Maybe buying fresh ground chicken as a substitute for the chicken breast that will be processed anyway. However, the oats may leave a chunkier consistency because it won't be processed as well. It's certainly worth a try. Cant wait to make these!..would it also work with the packaged already ground chicken? Yes, pre-ground chicken works beautifully, and then there is no need to throw it in the food processor! I've made baked chicken katsu in the past and to get the \"golden\" color, brown/toast the panko in the oven (or frying pan without oil) before coating the meat. Thank you for this wonderful recipe Katherine! I had the same question about ground chicken - would that work as well? I never thought to grind up the chicken before. I usually do all this with just chicken cut into strips then freeze them. Hmm....kids might like this better, more like the fast food junk!! LOL. If I freeze these, do I need to thaw them before baking or can I just put them in the oven still frozen? You can put them in the oven froze, and add 2 minutes or so to the cooking time! I just made these and they turned out great! Thanks for posting. I did toast my panko in a pan beforehand to get a nice brown color. Also I had to cook these for about 25 minutes to get them up to temperature. Thanks again! Can't wait for my little man to taste these tonight! Here's a tip for easier browning. I always toast the panko crumbs before I use them. They don't brown well when I've used them for breading, but when toasted beforehand (250 degrees for about 5 minutes or so, just WATCH them) they look much more appetizing, no broiling required. how about ground turkey? would that work? This sounds like a recipe we definitely have to try! 1) Can I skip the parmesan to make it dairy free? 2) Are we supposed to cook them on the cooling rack? I never knew if mine was oven safe? You can leave out the parmesan, I just love the flavor! Yes, cook them on the cooling rack, it helps them cook and brown evenly. If it is stainless steel it should be oven safe. Do I need to cook them before I freeze them? OR just freeze them raw and coated? Thank you for this recipe!!! I made it tonight, and it is a huge hit. They don't like chicken nuggets from restaraunts or frozen, so I was skeptical, but they are devouring these! And I love the taste. I only had breadcrumbs on hand (and oddly no parm), but they are great. Will make huge batch for freezing next time. Do you freeze the nuggets once they have been baked, or are they unbaked? And how long for re -heating once frozen? I can't wait to try this. My first two kids are great eaters, but my 18 month old is incredibly picky. He's so bad that we practically threw a party a few days ago when he ate the apple slices I put on his tray instead of throwing it all on the floor. Fingers crossed he'll eat these nuggets, it will be his first time eating chicken in months! These were a HUGE hit with EVERYONE! Even my picky 2 yr old! I served with sweet potato oven fries and it was a well rounded healthy meal. Thank you so much for this recipe! I have tried so many recipes and never thought to put the chicken in the food processor. I can say good bye to store bought nuggets for good! Oops in my excitement I forgot to add that my 3 yr old LOVES these! What dipping sauce do you use? I served these with ketchup and mustard! Made these for lunch today and they were a big hit. I really enjoyed them too! Just wondering, if freezing some for later, when I go to cook them do I need to thaw them first or cook them longer? Cook them two minutes longer. Catherine, I dont have a cooling rack to use. Can i use a reg cooking sheet? You can, but flip them half way through to ensure even cooking! What a great recipe! This sounds like the Big-M recipe. I like this because when my Granddaughter only wants two nuggets I can prepare them quicker than I can run to the Big-M, and save money! Thank you! Could a good blender work in place of a food processor? I am not that wise with kitchen appliances... Also, could you just use regular bread crumbs instead of Panko? The last few recipes I tried with Panko, dd didn't love so much? Wondering if it was coincidence or the Panko! The raw chicken might get stuck under the blade in a regular blender, so for this recipe a food processor is better, but you could also use ground chicken or ask the butcher counter at your local grocery to grind the chicken for you. Regular bread crumbs will produce a different consistency coating, and I love the texture and flakiness of Panko! Use whatever you have and are comfortable with! I am looking forward to trying this recipe. I was wondering if it is a problem to use quick oats, instead of the 5 minute oats indicated in the recipe? I thought quick oats were suppose to cook in 2 minutes, but I am not sure. Yes, quick oats cook faster and could get mushy in this recipe, so I would stick with the 5 minute oats! I made these tonight and they were FABULOUS and devoured by my 5yr old. Thanks for a quick easy recipe. I made them this weekend and the nuggets came out really hard and were just gross to eat. Oh no! If they were hard your oven may run hotter than mine. Try cooking them for less time! Was it just the fact that they were hard (probably overcooked) or was there anything about the flavor you didn't like? I made these this weekend; they looked so good I had to sneak a taste when they came out of the oven and they were delicious! Add another super-easy, delicious weelicious recipe to my regular rotation. Thank you Catherine!! Finally got my 17 month old to eat chicken! Thank you! They were easy enough for the husband to make (I'm a vegetarian). They didn't brown well, but neither the husband nor son seemed to care. Can you do this with chicken thighs? My little guy needs the iron where he can get it! Thanks! Yes, you can do this with any ground chicken meat, dark or light! I was just wondering if canned tuna could be used? We are catholic so no meat on fridays during lent. I am just not sure how to reduce the amounts of the other ingredients for a 5 oz can of tuna lol. I am Math incompetent hehe. Interesting idea! 1 pound is 16 ounces, so you could either cut this recipe into thirds, or use three cans of tuna! I'm not sure how it will come out, though. The tuna probably won't hold together as well as the chicken does, and it might get dried out after cooking. Please let me know your results if you do try it! I'm intrigued! Ohmygoodness! I have been hoping to find a recipe like this. I had brain stormed ideas but I'm not much of an experienced cook and was too afraid to test my own recipe. I cannot wait to try this. I feel too guilty feeding my son the store bought chicken nuggets. I like to also add veggie puree to the mix since my 13 month old is not liking veggies right now. I'll even make some nuggets that are ONLY veggies- spinach, carrots, brocc, celery, potato, etc. anyway I will have to try the veggie one! do you use raw veggies? Fantastic! So similar to fast food yet so different. I'm going to make a double batch tomorrow. Thanks again for the great recipe. I am still chuckling that there seems to be confusion between steel cut and 5 minute oats. Not being mean, but come on! Elizabeth, I thought the same thing! I have to cook steel cut oats OVER NIGHT in order for them to cook properly, lol. I'm going to try this recipe for the first time today but I have to use instant oats because it's all I've got...hopefully it'll work out. Catherine commented on this earlier... she said instant oats will cook too quickly and will become mushy. Better make a run to the grocery store! Btw I'm excited to try this recipe! Also \"disgusting\" is just a rude word to use about someone's recipe, regardless of what precedes it. Wow, That is the best nuggets I've ever tasted... I didn't add onion powder or oats because they weren't available here. I also used grated cheddar but the result was perfect. So easy recipe.. I also added a zucchini to the mixture to get my baby eat it. I totally love it so much, thank you million times. Freeze after coating in bread crumbs! My son is still 14 months, lots of these recipes here are great but not yet for him, do u have a special category for younger toddlers?? Thank you so much for posting this!! I was just thinking today the \"stuff\" that is in chicken nuggets and how I wish my kids would like real chicken nuggets I can make but they don't. This sounds perfect!!! I'm super stoked to try these! Again, thank you!! These are so great! I just made a batch for my kids (3yo and 15mo). They both gobbled them up. I got a nice big batch from 1.5 lbs of chicken. The best part was that it only took me an hour to make them. This recipes a keeper for sure! These were so easy! I scooped the chicken mix out of the bowl with a cookie scoop (which got me thinking), so after I pressed them in the panko &amp; parm and flattened them out a bit, I cut them into shapes with small cookie cutters! Super cute! Thank you for such an easy and delicious recipe! I made it tonight and both the kids loved it. Out goes the store bought ones.. IN come's these weelicious nuggets. Would it work to bake these and then freeze them for later? Then defrost them when ready to eat? Wanted to know if there were any other substitutes for the parmesan? Unfortunately, I dont like the taste of the non dairy cheeses. Wasnt sure if there wld be anything to help it bind without the cheese. Thank u! You can leave it out altogether if you don't want to use it. It adds flavor which is why I have it in there. The breadcrumbs are what really holds the nuggets together! You could also try nutritional yeast. Again with the food processer! i used a \"magic bullet\" to mix ingredients and that worked great. Made theses tonight the flavor is incredible!! I had a problem the Pablo bread crumbs would not brown the the oven and I way way way over cooked them because I was waiting for them to brown. Is there a better way to get brown color on them??? Thanks! Love ALL the recipes here!! Did you spray them with oil before baking them? That is how I got mine in the photo to brown. Some other readers have toasted the bread crumbs first before breading the chicken and that gets them brown and toasty without having to cook them longer! Thank you! My children absolutely love this recipe. Do you think this recipe would also work with fish? We did this with ground chicken form the butcher and also chicken breast in the food processor at home. Everyone chowed down the food processor version, but not the pre ground. It was much too dense. I highly recommend taking the time with the food processor. It really made a difference! When I finally found the time to make these, they were super easy and my normally picky children both ate their fair share of chicken. I used organic ground chicken and some basil and oregano and mixed it by hand. I'll have to try the food processor next time to see if there's any difference. Hi I made these and they tasted great but they came out a little dry and got even harder to eat after they got cold. No trouble for me to eat but more difficult for my little one. Any suggestions on how to make them more moist? perhaps add an egg? An egg would help keep them a little more moist! How long did you cook them? Try grating a small bit of onion with its juice, its suppose to keep meat moist. I use whole wheat panko, its naturally golden in color and a little more healthy! Thank you for all your awesome recipes! I live in Australia and we don't get kosher salt... Is this just a form of non iodized rock salt? Could I use this instead of the kosher salt? Kosher salt is not iodized so you could probably use the rock salt. You might need to grind it first! why chop and then shape into a \"nugget\"? how about cutting chicken into bite size nuggets? Awesome recipe! I bought ground chicken and then used my blender(don't have a food processor). I also added a small amount of mashed up carrots so they'd be moist. So its raw chicken that goes into the food processor with the other ingredients, right? I tried these tonight but they didn't turn out well, too dense. Disappointing! I added an egg as someone had suggested because I was worried they would be dry. But I was wondering if you can overprocess the chicken in the food processor - could that have been what I did wrong? Next time, I think I'll just cut up the chicken into chunks and rub them in the spice/panko/parmesan mixture instead of using the food processor at all, see how that tastes. I don't have a real food processor, just a mini one. So I was concerned it wouldn't grind the chicken good. But it did. The best part is, the kids liked them!! Hooray, no more store bought nuggets for us! The only thing I'm going to change for next time is to try grinding up the panko a bit. They didn't like the \"chunks\" of crust. These sound great I can't wait to try them! For making a big batch &amp; freezing do you cook them then freeze? Or freeze them raw? I couldn't find the answer. Thank you! Ps. I just found your website today &amp; there are so many recipes I can't wait to try for my 1 yr old! Cook and then freeze! To defrost I put them directly onto a baking sheet in the oven until they're defrosted and warmed through! Once again, another Weelicious recipe that is a total hit in our house. My 4 year old and 2 year old devoured them!!! I did add a cup of spinach to my chicken mixture and pureed it all up together for an added veggie kick to the nuggets. Delish! Can I substitute the oats for something else? We avoid oats due to them causing eczema flares in my little guy. Thanks! You could use mashed potatoes! I used quinoa flakes and they worked great! Thank you for posting this recipe. I have tried this recipe for my 22 month old toddler (20 month old at the time I made them). They were very good, however, they were a little dry and lacking moisture that would make them 'soft' /tender enough for my toddler to bite on them. My husband tried them and he really liked them and thought they were a little dry but he really liked the flavor. I really want to try and make them again but before I do I want to correct what may have went wrong. I followed the recipe exactly with the specified ingredients and baked them at the suggested time. I did some research on the internet and found out that one could marinate them in low fat buttermilk overnight. But if one is to place the chicken in a food processor; wouldn't that defeat the purpose of marinating them? I wanted to ask you if you could kindly give me some suggestions on moisture and make them tender enough were my toddler could easily bite and chew the nuggets. I hope I do not come across as confusing, but, sincerely, overall they were really good and I have not come across other recipes that tops this one. thanks again. I just made these tonight and I cut back on the oats a tiny bit and added an egg to the chicken mixture. I also used crushed corn flakes for the breading instead of panko (it's what I had) and they turned out wonderful. I actually only cooked for 14 minutes also (they were definitely fully cooked at 14 min). My 13 month old that only has his top and bottom two front teeth ate them well after I broke them up a tiny bit. I think the egg and a little less oats helped them because I tasted them and thought they were moist. Delicious recipe! I love that you can freeze them! Made these last night to have for lunches this week, but couldn't resist taste-testing a few! Delicious! I can see what other people mean about them being on the drier side, especially for little ones, but where it's just my husband and I that doesn't concern me much. These are super flavorful and easy ~ planning to make a big batch to freeze so I have them on hand for last-minute dinners. Side note -- yes, it's just my husband and I. No kiddos (yet) in our house, and yet several Weelicious recipes are in regular rotation here! Thanks, Catherine, for coming up with kid-friendly recipes that aren't just for kids. I haven't tried that yet, but I think if you got a high enough lean percentage that would work! Sounds great, I wold love to learn more recipes good for my little boy!! Just made these today and they were so easy! I put everything in my Vitamix and ground it all up. I agree that they were a little dry. I should have added the egg like others have suggested. But they look perfect (definitely put them under the broiler. Otherwise they're white and look odd) and taste terrific. I'm dunking them in BBQ sauce as we speak! This may sound silly but do ou cook the chicken before starting or do you use raw chicken in the food processor? Can I cook these and then freeze them? Yes you can! Lay them on a sheet tray in the freezer until they are frozen, about 30 minutes, then transfer to a ziploc bag or other freezer safe container! I made a double recipe with the following changes and they were delicious! 1 lb of each of boneless skinless organic chicken breasts and thighs, blended with all ingredients except oats (completely ommitted) in food processor. Rolled in regular breadcrumbs and parmesan cheese and baked as instructed. I sprayed the tops of the nuggets with Pam cooking spray and they were amazing! 56% cheaper than store organic nuggets! Thank you! I added thighs &amp; a couple of livers - and cut out the oatmeal, because I was concerned they would be too dry. They were really good. I noticed the video recipe uses mashed potatoes but the written recipe mentions oats. Are the mashed potatoes as substitute for the oats? Does one work better than the other? The mashed potato version is the recipe in the cookbook! Omg! Best recipe for kids! My whole family if picky waters loves these ! Thank you sooo much for all the great recipes. I have never written a review before. I just have to tell you these were a big hit with my daughter. She said \"
Mom you rock\". She couldn't stop eating them and exclaimed \"please make these everyday\". They are so easy and quick I'm making them everyday. I'm grounding my own chicken or turkey. On a side note I just want to add I substituted quinoa for mashed potato(I didn't have any) and added an egg to the mix. This recipe is GREAT! I wanted to try the version in the book but I didn't have mashed potatoes so I'm glad I came to the website and found this. My very picky daughter is eating them as I type this. It's so helpful that you include the freezer directions because I made a double batch. I used quality organic chicken so it really makes me wonder how companies are able to sell those huge bags of frozen chicken nuggets for only a few dollars. I'm sure they don't use only quality ingredients. Could you make the salmon nuggets this way? Hmmm that might work! I would be a little more gentle with the salmon, though. Maybe just flake it apart and mix with everything by hand before coating in breadcrumbs.